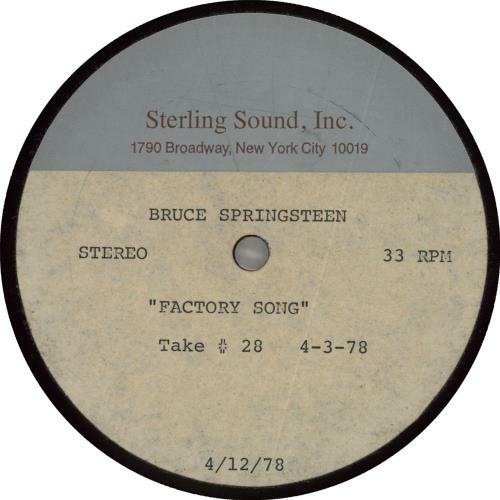 BRUCE SPRINGSTEEN Factory Song (Extremely Rare 1978 US one-sided 33 1/3rpm 12" sized metal based high grade methyl cellulose lacquer acetate for 'Take #28' of the track taken from the Columbia Records album 'Darkness On The Edge Of Town'. Theacetate was cut on April 12, 1978, almost two months beore the LP's release date, when the song was eventually named just 'Factory'. The labels are custom printed by Sterling Sound, Inc. with the original '4-3-78' recording date printed to theright hand side. Being the shortest song off the album, the disc appears in Excellent condition with very little cosmetic wear commonly associated with this format [see 'more info' for further details]. A prize item for the Springsteen collector). Tracklisting / Additional Info: An acetate is a transitional stage between the master tape and the finished vinyl record. Originally acetates were used for home recording in the days before tape recorders, but since the advent of cassette tape & CDR are now no longer used for providing bands & their entourage copies of today's studio efforts. A machine actually cuts the grooves into the acetate like a lathe. The acetate is used to assess whether the music has been successfully transferred to disc. It is checked by the sound engineer. There may be only one copy made of a particular recording, sometimes more are cut and sent to the studio and band members for approval. The acetate comes before making the master, and allows the sound to be checked without great expense. It is unusual for more than a dozen to be manufactured, so from the collector's point of view an acetate is a rare find indeed! If the recording is rejected the acetate may be the only record that survives. The rejected cut may simply be poor quality, however the artist may have opted to use a different take of the song, if so, the acetate becomes much more precious. An incredible find - possibly unique - and certainly one of only a handful.